Featuring seminars and classes to enrich and entertain, the Senior Expo aligns with Money Smart Week® with a special focus on financial literacy. Register for the 2019 Senior Expo! Certified Financial Planner Professionals will answer your questions about investing and financial planning in complimentary one-on-one consultations. The daily fluctuations of the stock market are enough to drive us crazy. But avoid stocks altogether and you might just go broke for lack of returns. Randy Bruns, President of the Financial Planning Association of Illinois, discuss the myths and realities of investing and demonstrates time-tested strategies for managing wealth through the most challenging times. Adam will provide a high level overview of recent changes in the tax code as they pertain to seniors, and related strategies designed to maximize after-tax wealth. This presentation helps explore the options of moving to a more manageable living environment or aging in place. The presentation will help break down the many factors that determine whether making a move or staying put is right for any individual. DuPage County is a source for local, state, and national resources for older adults and their families. Join us for an overview of the many services and programs available in DuPage County. We will provide information on programs that assist those in staying independent in the community as well as resources to assist family caregiving. Careful planning can help you get the most out of your Social Security benefits. This session will help you determine the ideal time to apply and ways to maximize your Social Security benefits while minimizing taxes on those benefits. Giving DuPage, the DuPage County Volunteer Center, will share information about volunteerism. Don't miss this presentation on how you can make a tremendous difference for positive lasting change in DuPage County. Also, learn about our newest service initiative, the DuPage Interfaith Service Council. Learn how to avoid becoming a victim of Internet frauds and scams. After working hard each week to get to TGIF, retirement may be in sight. Discover five keys to unlocking a retirement that's free from worry, where you can have full confidence in your ability to achieve your goals at the 5 Keys to Retiring Fearlessly workshop. Local career coach discusses what is unique about job searching after 50 in DuPage County and how to be a strong candidate in the multi-generational workforce. A qualified DuPage County SHIP (Senior Health Insurance Program) counselor will explain Medicare Part D and demonstrate how to navigate the Medicare website to review prescription drug plans. Downsizing and moving, whether across town or across the country, brings with it an array of challenges. Make your transition smooth and easy with expert organizing tips and tricks in this informative session. Prepare for your next French travel adventure! Discover where to go and what to see, acquire survival phrases, and learn how to read signs, menus and transportation schedules. Explore cultural differences and be prepared to fully enjoy your destination. Learn the ancient Chinese martial art transformed into a healing art. Tai chi enhances concentration, balance, flexibility and peace of mind to aid in aging well. Join this fun, upbeat and interactive session with games designed to exercise your memory and cognition. If you are interested in being a vendor or sponsor at this year's expo, please visit our sponsorship page. 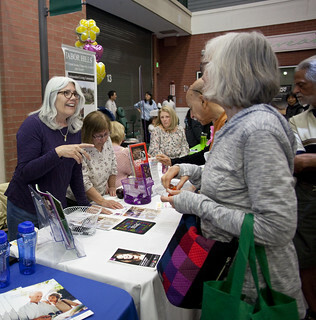 The fifth annual Senior Expo, which drew approximately 360 attendees, featured vendor table exhibits, and provided information on a broad range of topics, including brain health, career searching after 50, investment strategies, Medicare, Social Security and travel.